Cycle Trekkers - Page 2 of 14 - Adventures around the world on two wheels! A handful of people know that I’m running the Polar Circle Marathon in Greenland this Autumn. I haven’t told too many people about it – why Because, frankly, I have no idea whether I’m actually going to make it to the end. It’s going to be up there with one of the most extreme ‘whatthefuckwasIthinking’ challenges of my life. I hadn’t planned on making this event a charity fundraiser, however when I recently received an email from the Ometepe Bilingual School in Nicaragua, explaining how the recent riots have had such a negative impact on their school and the children, I thought it was an opportunity to help out. Hey, if I’m risking losing an ear or nose to frost bite, I may as well do it for a good cause! For those that don’t know, I visited the school last year while Michael and I were cycling through Nicaragua. We had the pleasure of staying at Hacienda Merida – an eco-friendly hotel on the stunning Ometepe Island. The hotel is the main source of funding for the school. What makes Ometepe Bilingual school so special? 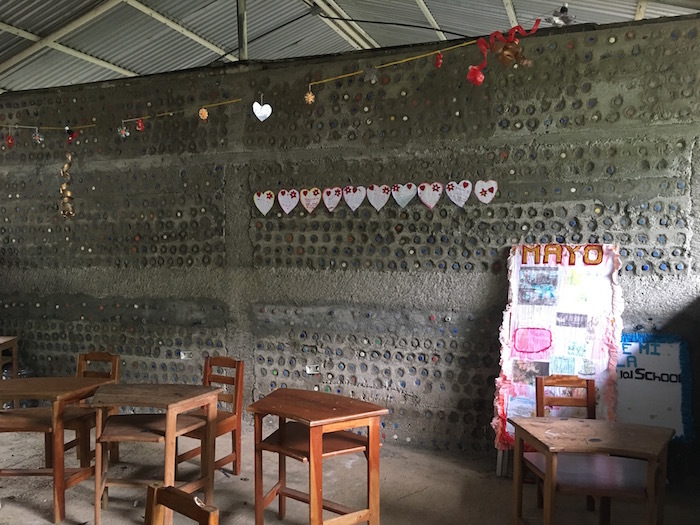 The school is made out of rubbish – literally. 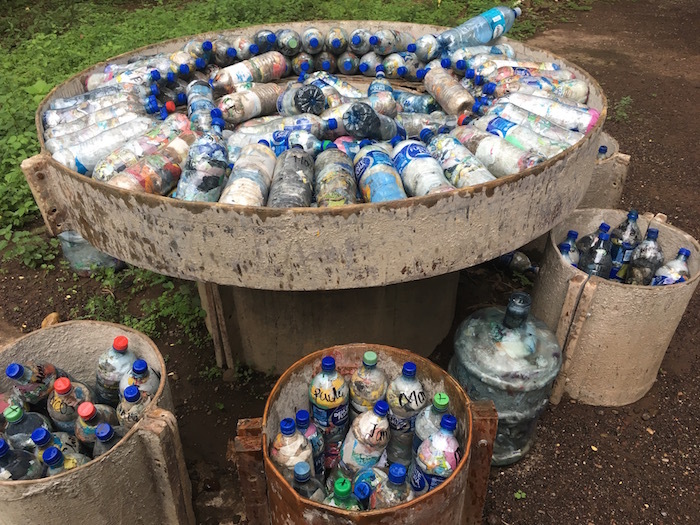 Thousands of plastic bottles filled with rubbish can be found within the walls of the school. The school has a strong focus on sustainable practices, ecotourism (not greenwashing), reducing, reusing and recycling. If you want to read more about the sustainability of the school – I wrote an article on it last year. It is also one of the few (if not only) schools in Nicaragua that teaches the importance of sustainability, as well as teaching both English and Spanish. The school recognises that becoming bilingual, and having an understanding of the importance of sustainability and environmentalism is a stepping-stone for the children on the island to empower themselves, and have a positive impact on their community. I should also mention that the school provides the education to children for free. The children that attend the school, predominately come from poor families. The school has been providing a great opportunity for these children. You can still see the eco-bricks in the wall of the school. These riots have impacted on the school in a number of ways. The riots have decreased tourism to the area. The school runs of profits from the hotel. The riots have resulted in many cancellations of bookings, and very few people visiting the island or the hotel. The riots have also resulted in roadblocks, resources not reaching where they are most needed and the government withdrawing funding to schools to cover the cost of lunches, which were previously provided. I haven’t found that the riots have been covered that much in the media in the UK, but to give you an idea of what has been happening in the country, I have included a couple of news articles worth checking out. Hundreds of people have already died in these protests, which started in April, and sadly they don’t seem to be ending anytime soon. To think the riots started in response to a peaceful protest against pension reforms. Sadly, if the riots don’t cease soon, and/or the school doesn’t find another source of income, then it’s likely it will close. 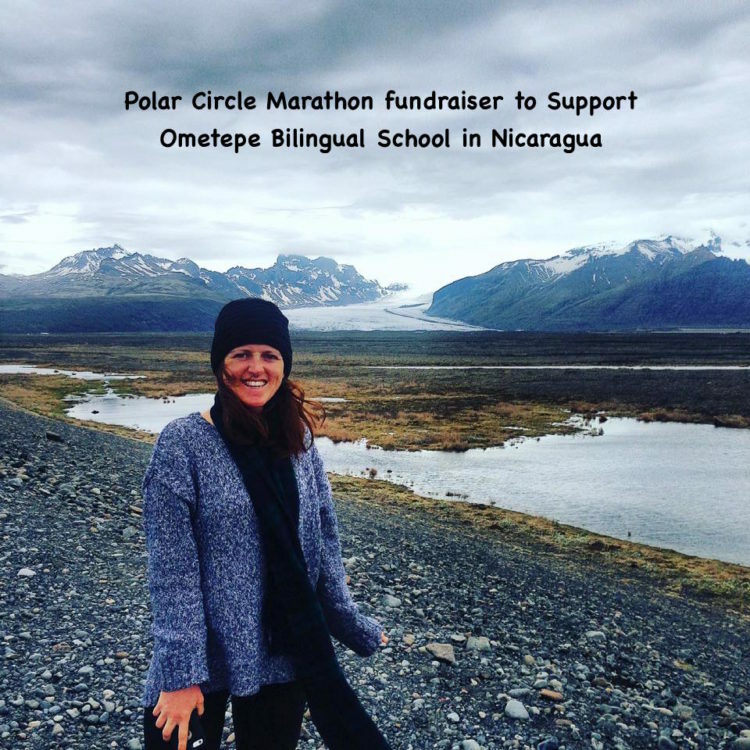 Please sponsor me in my Arctic run, and help keep the school open! Being the eco-minded person I am, I fell in love with the school, as well as the hotel. As well as writing an article about the school, I even included it in our Nicaragua Cycle Video. This may not be a challenge by bicycle, but it’s a human-powered, challenge nonetheless, and one, which I hope, will raise some funds for this amazing school, as well as raise some awareness about the issues currently taking place in Nicaragua. If you have any questions about the marathon, the school, the hotel, Nicaragua or anything at all – please drop me a line. Thank you for taking the time for reading. If you are in the position to sponsor me – thank you! If you are not in the position, please spend a minute and share this page with your friends and family. 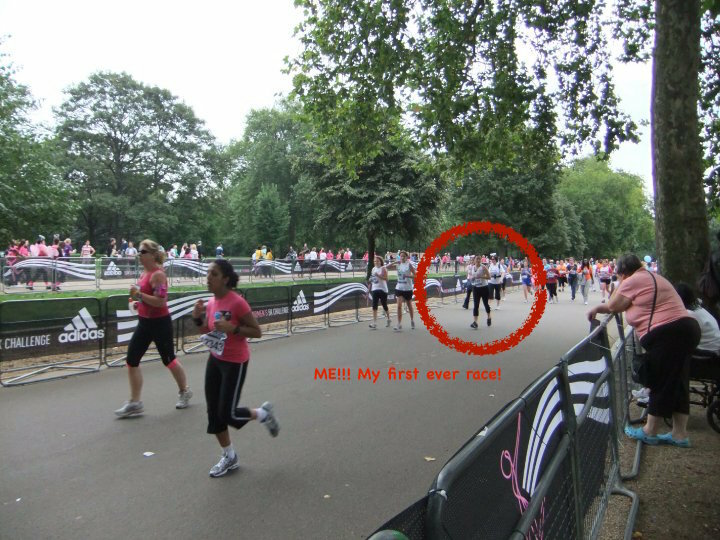 I felt like I needed to include a photo of me running, and this is the only photo I could find! Whether you would like to spend a few relaxing or challenging days at a new destination, it is important that you plan your trip in advance. You need to make sure that you are ready for the trip, and you have everything covered, from accommodation to protein bars and transport. The following tips will help you get your priorities right and book the perfect getaway that will make you feel satisfied and accomplished. Rain or shine, you’ll be outside biking in it, so the weather will have a huge impact on your trip, and is something you need to plan for. 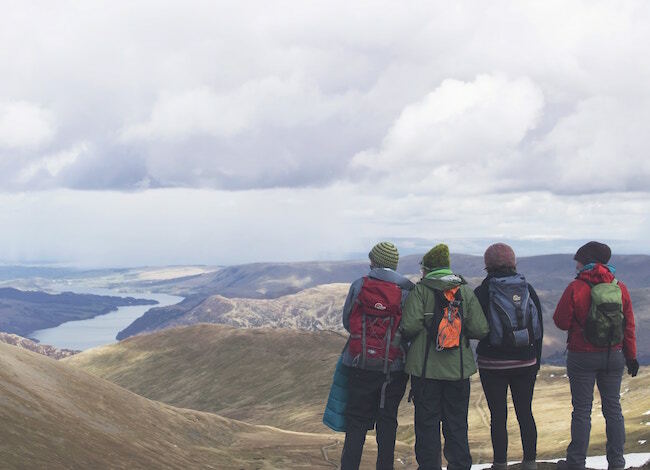 Just keep in mind that old saying, “there is no bad weather, just bad clothing!” It is important that you check out the weather forecast and get plenty of waterproof items in your backpack. If you are planning a tropical trip, ensure that you have adequate sun protection, and have the ability to carry sufficient water. You may even want to plan your day accordingly, resting during the hottest part of the day, so to avoid the heat and potential dehydration, or even sunstroke. A perfect excuse for a siesta! You might want to find a hotel or guesthouse that is conveniently located close to all the routes you would like to complete. Or, you might prefer pitching a tent, under the stars, in an unplanned location. Whatever you preference, you need to consider this before the start of your trip. If you are heading to a big beautiful city, such as Panama, you might want to splurge on a hotel like the Marriott Executive Apartments Panama City. However, if you are budget conscious you could always try finding a host through the amazingly useful Warmshowers website; a website dedicated to cycle touring, and finding hosts for travelling cyclists. Before your trip, you may need to check whether there are recommended and affordable bike rental places. 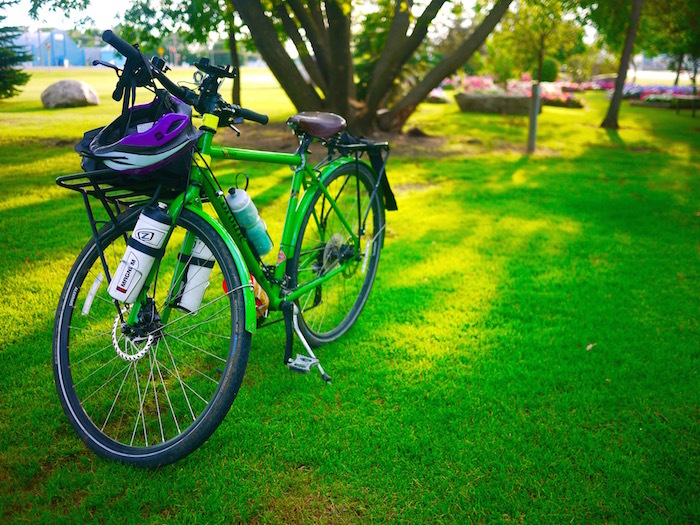 Sometimes renting a bicycle locally is more economical, as well as efficient, compare to bringing your own bicycle with you. If cycling in the summer month in Europe, and considering local bicycle rental, it is recommended booking your bicycle in advance, to ensure you secure the best bike at the best price. Arguable even more important to this, is researching bike repair stores along your route. When going on a cycle trip, no matter the length or location, you will need to get adequate insurance. If you suffer an accident or fall ill, you might not be covered for medical treatment. If your bicycle is stolen or damaged, you also might not be covered. Compare the prices online before your trip, and make sure you ask the relevant questions. Some insurance companies consider cycling a dangerous sport, and will not cover you for long distance cycling. When it comes to travel insurance for cycle trips, it is always better to be safe than sorry. 1) Independently, arranging your own transport, accommodation and route. This option suits those who love the adventure and freedom of making their choices and not having to follow a set plan. 2) Joining an organised hiking and biking trip, with a tour company. This option is great for those first time cycle tourists, or those that love touring in groups. Leave the planning and stress to someone else, and just enjoy the ride! Whether you are looking to cycle across Europe, or bike and hike across the Scottish highlands, and cycle trip will involve a level of preparation and planning. Treat this planning as part of the journey, and use it as a way to build up the excitement for your up and coming trip. Safe bike trails! The Seattle Urban loop in Washington is the ultimate place to ride your bike, from the stunning vistas across Puget Sound and Seattle seafront, to the perfectly maintained trails and cultural encounters. Pleasant scenery and easy riding ensue once you depart from the bike racks in Gas Works Park, and cycle onward to Magnolia Boulevard. The Seattle Urban Loop eventually reaches Lake Washington, before passing the University of Washington and returning to the original starting point in Gas Works Park. However, it is only upon reaching the ocean at Alaskan Way, when the appealing nature of the route is clear. Fishing boats, and cruise ships take to the open seas while the sun reflects from the incoming waves, and cycling along the Seattle waterfront is suddenly a cultural experience, as well as being a most enjoyable adventure into the outdoors. Rugged cliffs form a natural barrier against the marauding Atlantic Ocean in Acadia National Park, home to the best cycling route in Maine, and one of the most scenic regions on the west coast of the United States. The Cadillac Challenge Loop is a 27 mile route with a seemingly never ending series of bends that wind their way past soaring ocean views, isolated coves, luscious landscapes and romantic lighthouses. 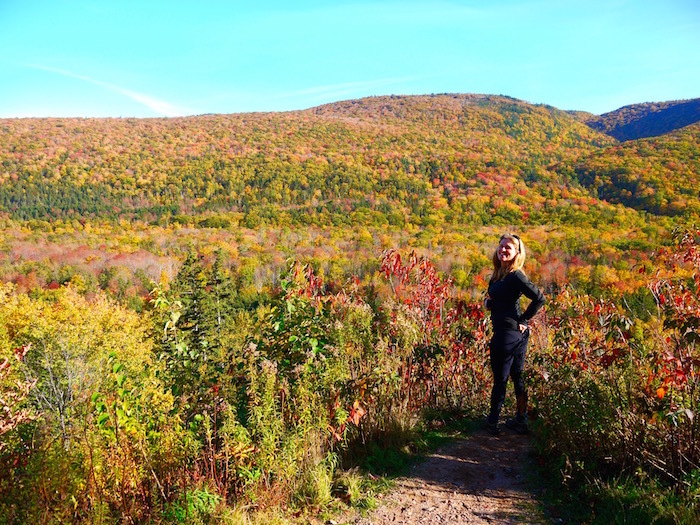 However, the real attraction of cycling in Acadia National Park, is the Bike in Acadia month, a government initiative in which the roads at the park are closed. 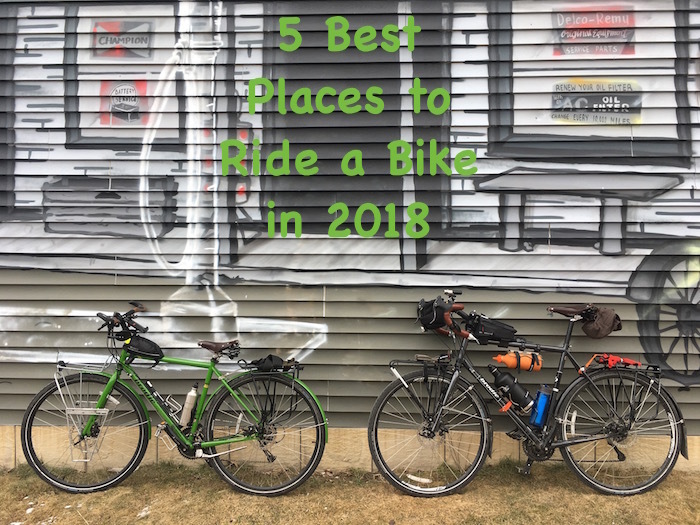 There is simply no better place to see the sun rising, or going down, in Maine and the opportunity to cycle in pleasant surroundings without the distraction of traffic, makes Acadia one of the best places to ride a bike in 2018. Experience the splendor of Moab by bike, an unforgettable mountain bike route with stunning views through magnificent canyons, and a series of trails for all levels of experience. Moab has some truly awe inspiring scenery, from the Amassa Back Trail which climbs to the top of a giant mesa perched out over the Colorado River, to the immense sandstone walls which tower high on the Arizona skyline. Another highlight is the varying levels of experience required to visit Moab on a bike, the Slickrock rock trail is a world famous and highly technical route, whereas the Bar-M Loop Trail has a much easier terrain, while still offering the same incredible views of the other routes. A proper bike rack for SUV or car will allow you to carry multiple bikes and secure them properly until the destination. While it may be a distance for more experienced riders, the 160 mile stretch between Miami and Key West is a highly rewarding cycle route with tropical landscapes, wildlife and a relatively flat terrain. Few places in the world can boast the views between Miami and Florida, with palm trees lining both sides of the road, and sweeping ocean views providing an unforgettable backdrop. 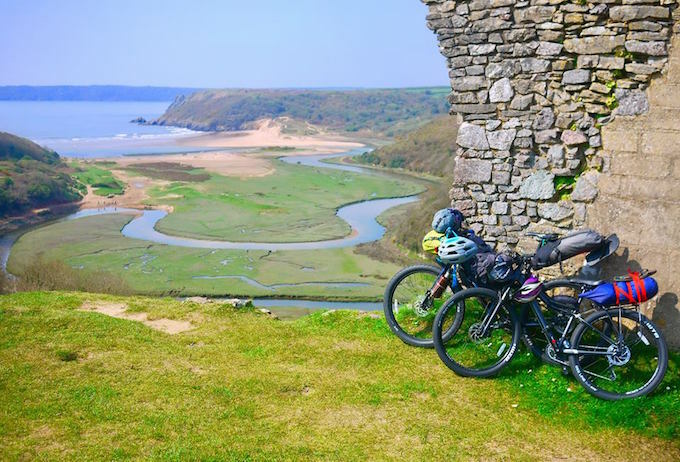 The route is also known for having a reasonably flat terrain and a refreshing tail wind which only adds to the enjoyment, and allows for the possibility of completing the 160 miles in a single day. Unique and treacherous, the variety of experiences is obvious when you must keep a look out for alligators and snakes, which often take to the roadside for the heat of the pavement. Regardless of the obstacles, cycling from Miami to Key West is one of the most entertaining cycle routes, and a ride with a wide variety of things to see. While not as famous as the Moab, the Black Canyon Trail is another mountain bike trail in Arizona which makes this list with no apologies. The trail stretches for more than 60 miles through desert, cacti and sandstone canyons with thrilling downhill’s and challenging riding. Beginning in the overgrown Prescott Forest, Black Canyon is mostly a descending trail which leads across dramatic views of giant mesas, past the Bradshaw Mountains, and through a series of inspiring canyons. Even though this trail was purpose built a number of years ago, the surroundings are entirely natural and a day spent in the depths of the Arizona wilderness, offers an isolated adventure which is every bit as enjoyable as the more popular trail in Moab. Do not forget that choosing the best hitch mount bike rack is the key to safely transport your bikes to the destination and keep them intact. So, you now have a bike and can’t wait to ride in on a unique mountain trail? It’s really hard deciding on a good enough trail, though, isn’t it? 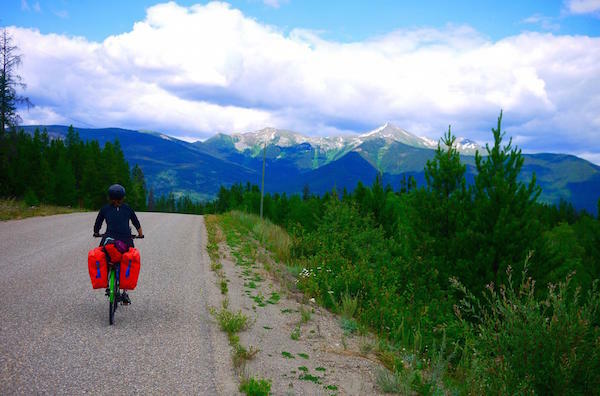 Well, if you need awesome research fast, we’re here to help you with 5 best picks of breathtakingly gorgeous mountain scenery you can enjoy while cycling. This is definitely a five-star ride, encompassing 26 miles on various side trails which will take you in the ballpark of 5 hours total. The level of difficulty is an intermediate one, so chances are most people can do it. We love the landscape most of all, it looks pretty rugged and has plenty of views you’ll want to stop and admire for longer. You’ll already going to start at quite an elevation of about 10,000 feet, which means you’ll be cycling very near the edgy peaks. You even have to gain some 1,400 feet more up to the narrow Burro Pass, but that’s nothing compared to the descent. So get the best high-power binoculars because you won’t want to miss a detail. The aspen forests are imposing, and the old pines look like giant soldiers that guard the entrance to the prairie. The fast flowing creeks and slippery tracks of Hazard County explain why this portion of the trail has this particular name. Then, the Porcupine sections are a challenge as well, but the view when you get to the Colorado River is totally worth it. The terrain is very diverse, you’ll get to try different technical skills from thru to single track, so that’s why it won the gold medal. If you’re a real mountain biking fan, you must visit the place where it all began. And that will prove very insightful because Crested Butte in Colorado offers plenty of trails to enjoy taking you through some of the most enchanting alpine landscape you have ever seen. The trails that wax and wane here are all nearby bucolic mountain towns too. Among the 750 miles of trails, one still stands out. Trail 401 is another intermediate ride stretching of about 14 miles at an elevation of about 9,700 feet. The ascent starts on Gothic Toad to what is called Schofield Pass. The views are outstanding and the faraway Maroon Bells look spectacular. This will mostly be a singletrack, which explains the intermediate level. However, there are whole green fields that stretch before your eyes and patches of aspen forests to roam through, so this trail looks amazing even during the fall. You might think we’ve selected this trail purely based on its peculiar name, but you’d be wrong. Lake Tahoe is an amazing area, it’s a huge alpine lake with crystal clear waters and plenty of interesting biking trails around it. So while this is an already popular destination, its southern part is what’s considered the cherry on the cake. That’s exactly where you’ll find the Mr. Toad’s Ride, which is indeed very wild since it encompasses 20 miles of advanced single tracking at an elevation of about 6,300 feet. That’s what makes it very technical, therefore more appropriate for experts. You’ll feel a real adrenaline rush coursing through your veins as you’ll be going downhill as well. Granted, you have to do quite a bit of vertical climbing before that, but once you get to Tucker flat you’re in for a real roller coaster ride. There’s also the Saxon Creek portion with its quite challenging singletrack descent. All that takes place among the most breathtaking vistas of forested areas and through plenty of meadows. The overall distance is 20 miles, so make sure you get enough water and snacks for the ride. Traditionally called the Wydaho area, this is where the Jackson area is located. Jackson Hole is remarkable among the nearby Teton Mountains, so that’s another great place if you’re into the thrill of the downhill ride. That’s because these mountains have very abrupt walls, and they’re really huge. Biking around here is a thing just as of late, though, so the trails are very new and look well and they’re quite diverse from downhill to cross country, to single track. So you can choose your poison, but the trail between Cache Creek and Game Creek is really a game changer. Apart from the fact that it looks incredible, with amazing views of the massifs, this intermediate 10-mile loop ride runs through a semi-wilderness of immense valleys, and you’ll get to experience an isolated cross-country run. Located in Sedona, which doesn’t boast as many trails as other regions, the Hangover Trail is one of the few precious gems in this area. 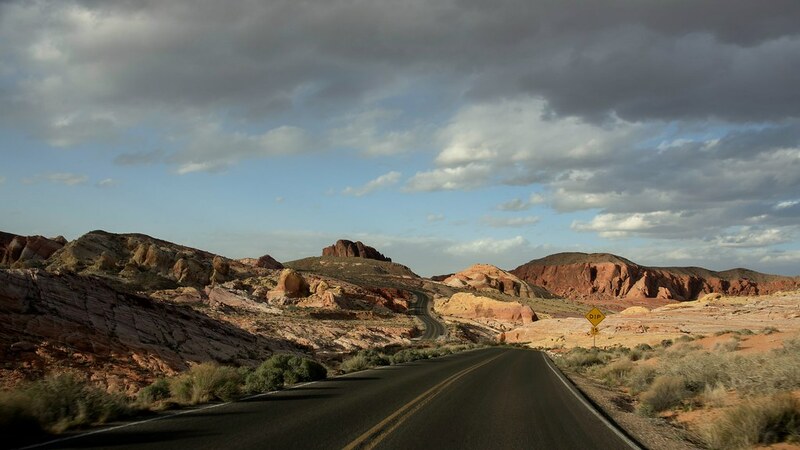 That’s because it combines an accessible and technically difficult terrain with its heart-throbbing landscapes with red rocks that will make you think your cycling on Mars. The vortexes in Sedona look quite eerie too, and the single track trail that stretches on 3 miles can nevertheless be considered for experts only. At 4,400 feet, the Hangover trail is very technical but also very dangerous because of its abrupt rocks and rolling terrain, combined with narrow trails and a massive exposure. But the views are indeed amazing, considering you’ll go up on a saddle-like formation and then keep riding about 200 feet on the rim of the abrupt canyon. You’ll ride on slick rock for the most part, but there are different sections too like dirt trails, step-ups, roll-off portions and the treacherous off cambers. With so many thrilling mountain trails to do on your bike, we’re curious where you’ll be heading next. What trails have you tried so far? What did you love? What did you hate? Leave us a comment and share your story. Do you love cycling? Well, there’s a way you can love it more, even if that’s hard to believe. If you get some top gadgets that are, for good reason, all the craze now, you can raise your fun level incrementally. Don’t know what to choose? Read on. Cycling in the dark is a great experience. And it’s amazing because at night everything looks different, the streets are quieter, and the world gets an eerie look. Or you might just be getting late off work, and you still want to ride your bike home. So a front light can be great for fun, but also practical for those awesome night rides. With the best helmet cam you can find, you’ll be guaranteed lots of fun. Now you won’t have to stop every five minutes to take amazing outdoor photos. Besides, it will prove a great entertainment even when you get home and you look at everything you caught on tape. And there’s nothing better than original snapshots that actually capture true bits of life. How can you enjoy yourself if you’re always worried that someone might steal your bike? Well, a smart lock takes care of that issue. And we’re not talking about an ordinary chain that can easily be cut, without you even knowing it. But if someone tries to break it, it will immediately start a very powerful alarm, while you’ll be sent a message. And even if the thief gets away with it, there’s a built-in geolocator that will tell you the exact position. This feature can also be amazing if you don’t remember where you parked your bike before a fun night out. Everything is smart these days, so why not the pedals too? These babies come with their own GPS, so once you get moving, the GPS will begin recording your journey. That’s great if you want to use cycling for fitness, particularly because you’ll get a better idea of your speed and elevation. You can also get an app to use along with this kind of thing, which is amazing because you can control it remotely, without bringing your phone along. And don’t forget that this pedal is so smart, it doesn’t even need a battery to work, as it can generate its own energy. If this isn’t the mother of all bike gadgets, we don’t know what is. Speaking of safe fun, you’ll need to use the turn signals so you can let other cyclists and drivers know where you’re headed, right? So there’s no easier way than using gloves which can light up with an easy touch. That’s perfect for those night joy rides, but can even be used during the day. That’s not for charging your bike, but instead, it uses the kinetic energy produced by cycling to charge your other gadgets. This is very useful when you’re going on prolonged cycling trips, and you still want to pack light enough so you won’t be destabilized by a heavy backpack. So instead of carrying a phone charger with you, you can easily get a bike charger that’s placed on the rear hub so it can charge with energy directly from the wheel. If you love listening to music while you’re cycling, but you’re still afraid of some accident that might happen, you should get a speaker. There are box-shaped speakers that look like a water bottle, which can easily be hanged to your backpack. The best of them are waterproof and resistant to impacts, and since they can be confused with a water bottle, no one will know where the cool music stems from. If you don’t want to lose time using a map or a GPS, and if that Siri-like voice really annoys you, then a smart navigation system is all you need to get you to your dream destination. This device is easy to use, it goes right on your handlebar and uses a phone app to tell you where to go. Don’t forget the awesome LED that helps with poor light too. How can you get through awful, rocky terrain if you don’t have a mountain bike? If you still want to use your own in lieu of that, you need a friction drive that can easily be set up to your back wheel. That helps you with those mountain roads that combine forest trails with paved paths. Basically, you’ll be getting a rubber cover for your wheel, which you can also use if you want to show off at home with cool moves. This isn’t a gadget per se, but it’s amazing for those cycling trips that last for days at a time. And since it’s impractical to put all your stuff into a backpack, then you might use this sort of trailer. The best models on the market don’t weigh much, they’re water-resistant and scratch-proof, so you can easily use them in different terrains. Will it slow down your game? Sure, but it will be totally worth it to bring a piece of home comfort. Yes, you can actually get one of those. That’s not technically for having fun on your bike, but more likely when you get off your bike. Say you want to go on a sightseeing tour and pedal your way along magnificent views, but you still want to stop once in a while to visit a museum or drink a cup of coffee. Now, carrying your helmet might really be uncomfortable, so folding it up in a tight little pack and stuffing it in your backpack is a dream come true. Do you love asphalt painting as much as you love cycling? There is a way to combine these two, and that’s by using a Chalktrail. This device is mounted on the rear end of your bike, leaving colorful trails on the sidewalk, so you can actually paint with your bike, which is amazing for kids and grown-ups too. With so many awesome gadgets to choose from, we’re curious what you’ll pick. Do you already have one of these? Leave us a comment below. 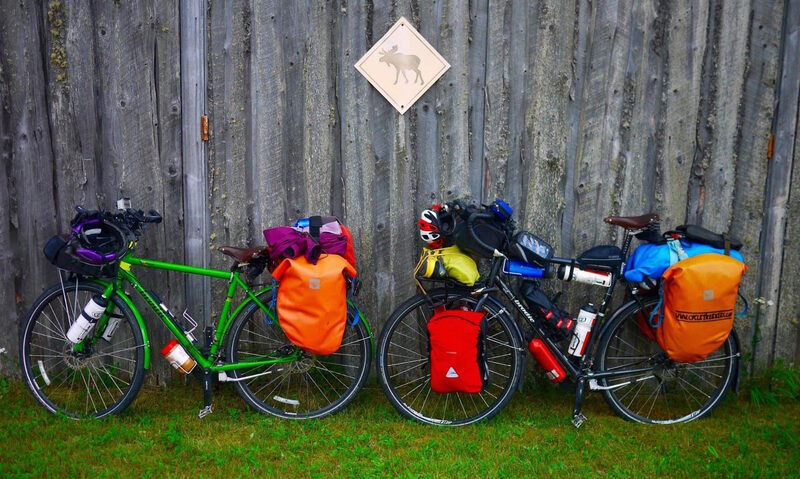 Need an expert’s advice on what to pack for a hiking trip with your bike? Well, you’re on the right page. Apart from the bike and the helmet which you can’t leave home without, there are quite a few items that should be on your list too. You’ll need quite a few bags to ensure that all the weight you’re carrying is evenly distributed and that it doesn’t destabilize your bike. The first thing you should consider is a hydration pack because you need to stay hydrated on the trail, so you can add to your miles without getting a headache. Besides this, you’ll also need a very light backpack, with padded straps that can be worn for prolonged periods of time. Make sure you get a water-resistant item that can also withstand possible scratches from all the tree branches on your way. You can also get other types of bags, like a saddle bag for bigger equipment, and a handlebar bag for the gear you really need to have at hand. A trunk bag can also be of use if you’re carrying a tent with you. And if you’re cycling across paved forested paths, a trailer can become your best friend, though it might slow you down a bit. Now that you’re prepared with the optimal gear storage, you need the actual equipment too. Since you’ll be on your bike most of the time, you need ultra-light hiking gear, even if you’re dealing with a tent, sleeping bag and sleeping pad. And yes, there are such items which, despite their low weight, they’re still insulating, waterproof and scratch-resistant. Make sure you get compact items too, not just light ones. You need to make sure you can set them up and take them down pretty fast since you’ll mostly be on the move. Apart from that, you should consider the right clothes for both hiking and biking. Even if you’ll be cycling, you might also like to take some short hikes around the camp. The first thing to start with is a moisture-wicking first layer, consisting of a top and underwear that don’t absorb moisture. You can think of merino wool for that because it’s a bacteria-killing, odor-proofing and insulating material, which keeps your body temperature constant, unlike cotton. You should also look at padded tights that offer insulation combined with breathability. Make sure you get water-resistant and padded gloves, so your hands don’t have to absorb the shock of the rugged terrain. A pair of bike shoes is essential, but you should take some ankle-supporting sports shoes too for those side-hikes. Don’t forget moisture-wicking cycling shoes as well as a skullcap to protect your head from the sun. If it’s raining, you’ll need rainwear that’s also windproof, and an insulating second layer possibly made from fleece or wool, depending on the temperature. If it’s really cold and windy, you’ll need both arm and leg warmers, and a visibility vest is a real life-saver for foggy weather, especially if you’re cycling somewhere near a hunting ground. Sunglasses are great for keeping your eyes safe from the strong sun, but they can also be great for rocky terrain, where small pebbles can get in your eyes. Don’t forget sunscreen against the dangerous UV rays and lip balm to keep your lips from cracking because of the wind. Of course, a First Aid Kit is a must, but make sure you have it complete and up to date. Stash your medical info card inside it, in case of an actual accident. Add some insect repellant to make sure you’re safe from bugs too. In terms of accessories, the first things you need are the lights. So make sure your headlight and taillight are working well, but you can likewise get a helmet light with strobe mode in case you get lost. Don’t forget your mirrors and taillights, so there are some cool-looking cycling gloves with included turn lights on the market. You’ll need a resistant lock too, even if the camping spot seems safe. You can even get a smart lock that lets you know when someone tries to steal your bike, while it emits a deafening alarm too. But your bike isn’t the only thing you need to secure. The water bottles you carry should also be kept safe, or otherwise, you might end up with no potable water for the road. That’s why water bottle cages are essential for rugged terrain. Don’t forget some paracord or straps – you never know when you’re going to need these for a rough ascent or descent. The essential repair tools start with a patch kit that’s compact and lightweight enough to carry. This should include a spare tube or several of those, a pump to inflate your wheels and tire levers so you don’t have to improvise a support while you’re working on your bike. A multi-tool doesn’t hurt either, but make sure it’s specifically designed for cycling and that it has an Allen wrench included there too. If you want to be more prepared than that, you might also need a couple of wrenches and a general multi-tool. You should also consider a pressure gauge if you have the room, and duct tape is a definite must. 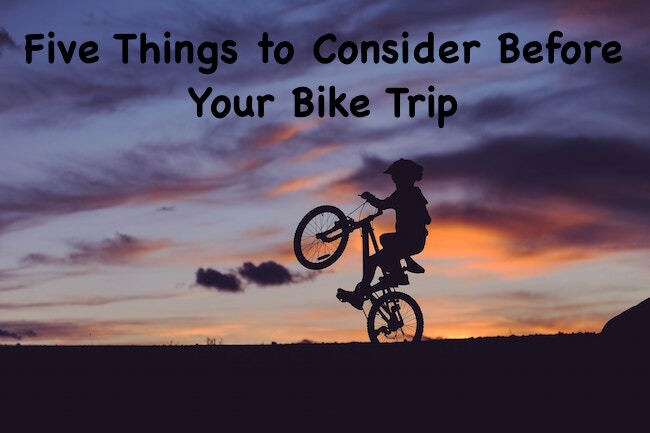 You can think of a spare brake cable too, that can be pretty important for rough terrain, but there are plenty of other spare items to take if you have the room, like spokes, tire, cleats and other components. Don’t forget cleaning supplies and toiletries like soap, toilet paper, a quick-dry towel, toothbrush, and toothpaste. Some of these might be accessible at different camping spots though. Of course, you’ll also need a camera to capture the beautiful landscapes, your phone, and GPS with the maps of your trail. Don’t forget to get enough money and an ID. All that gear is bound to make your trip more fun and also safer, so we hope we helped with a comprehensive checklist. So now, it’s your turn: where are you going? What will you be taking? Leave a comment below.